I’m having a bit of what I call a “Baker’s Block” (instead of “Writer’s Block”) recently, because many of the recipes I’ve tested these days came out only okay. They don’t taste that amazing for me to blog about them or maybe I lacked a crucial ingredient to make them look/taste better (e.g. I made Pad Thai without beancurd / bean sprouts). Anyway, end of story is that all these recipes are on hold… and until I can make them again, they won’t be appearing on the blog anytime soon. Thankfully and finally, I managed to whip up a successful batch of Roasted Pork yesterday and as promised on my Instagram, I will be posting the recipe here! Second attempt at making the roasted pork, served with char siu. Roasted Pork, also known as Siu Yuk, Siu Yok and Shao Rou (烧肉) is one of my favourite food, so of course I miss it terribly when I moved away from Singapore. 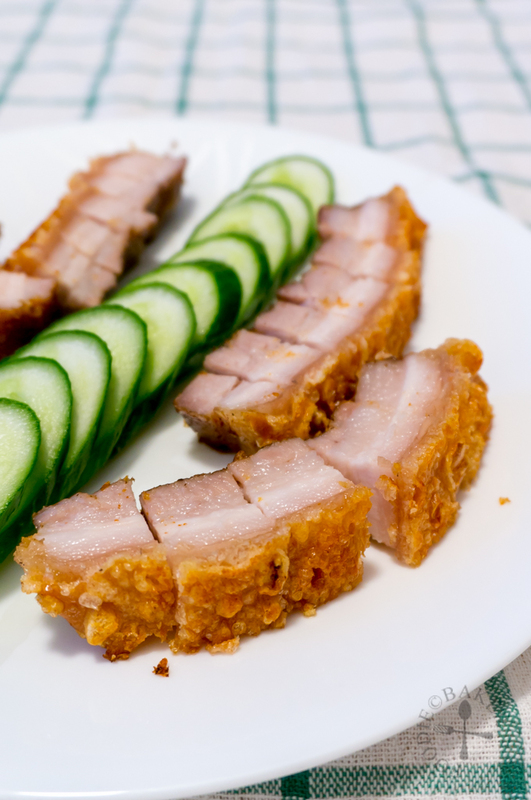 I started researching for recipes on Roasted Pork, and found that a common way to make Roasted Pork is to first blanch the slab of pork belly, dry and marinate it, then left in the refrigerator to dry out the skin. The pork is then skewered to keep it straight, then roasted until the skin is charred. The charred parts are then scrapped off before it is chopped into chunks and serve. Really tedious isn’t it? Then I found a YouTube video which makes things a lot simpler – the pork belly is simply marinated, wrapped in an aluminum foil tin, dried in the refrigerator, covered with a salt crust, then baked for an hour. The salt crust is then removed, then the pork belly is broiled until the skin is crispy. So I decided to try this method instead. When I first made this, not sure if I used too much salt in the dry rub or if it’s because some of the salt from the salt crust fell into the aluminum foil tin – the meat was so salty that we couldn’t eat it at all. I ended up chopping them into tiny pieces and used them in fried rice. The second attempt came out really well – I used lesser salt in the dry rub, and mixed the salt crust with a bit of water so it’s easier to apply on the skin and the crust will harden during baking, making removal a breeze. The crackling was absolutely stunning – the skin was a beautiful golden colour and absolutely crispy. The third time (this time) came out really great as well, but as it had been raining the whole day, the lighting was poor, and since I have minimal experience in shooting in such lighting, the end-product photos turned out pretty horrid, ugh! But nevertheless, I think it’s time to put this online because… X and I made a video of the whole process and I couldn’t wait to get it online! It’s not of superb quality of course but I think one will understand the steps better as compared to just looking at step-by-step photos. Had to cut out and speed up some parts so the video won’t be too draggy – hope this 3-minute video will help in your attempt in making a crispy and absolutely delicious Roasted Pork! Rinse the pork belly and tweeze out any pig's hair you see/feel. Rinse again and pat-dry pork belly thoroughly with paper towels. 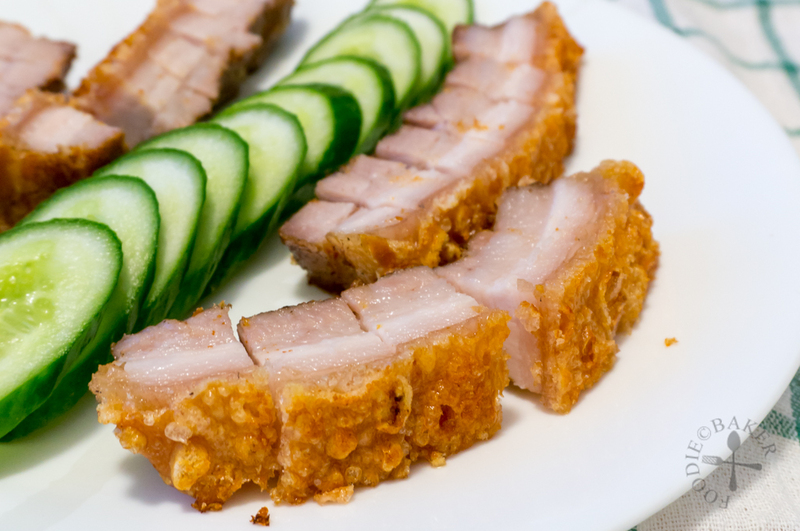 Using a fork or a skewer, poke holes on the pork skin, making sure not to poke all the way through to the fats. Turn the pork belly skin-side down, then rub Shaoxing wine lightly all over the pork meat and fat, making sure to leave the skin dry. Mix salt, five spice powder and white pepper in a small bowl. Rub the dry rub all over the pork meat and fat. Place a large piece of aluminum foil on the table and place the pork belly, skin-side up, in the middle. Fold the aluminum foil to form a tin, making sure the meat is snugly fit inside the tin. Place it in the refrigerator, uncovered, overnight or up to 18 hours to dry out the skin. Take the pork belly out from the refrigerator (no need to let it come to room temperature). Brush the skin with vinegar. Combine plenty of coarse salt and a little bit of water so that the salt can pack together. Spoon the damp salt onto the pork skin. Press the aluminum foil against the meat and push the damp salt to the side, so that the salt covers the skin but don't fall into the aluminum tin. Repeat until all the skin has been covered with coarse salt. Place the pork belly in the middle rack and bake for 45 minutes. Remove the pork belly from the oven. Preheat the broiler. Carefully lift off the salt crust and brush off any remaining salt. Transfer the pork belly on a wire rack over the aluminum foil. The aluminum foil will catch the fat drippings, making cleanup easier. Place the pork belly on the highest rack and broil until the skin is bubbly (like tumors) and crispy, which will take about 10 to 15 minutes. Once the skin is crisp to your liking, remove the pork belly from the oven. Let it sit on top of the rack and cool for at least 15 minutes before chopping it. Once cooled enough to handle, chop the pork belly into chunks (savour the moment when the skin cracks!) and serve with sliced cucumber and rice. - Try to get a piece of pork belly as even as possible from your butcher. I always ask for the part with no bones. The pork skin should be smooth with no cuts in it. - Do not poke all the way through to the fats, otherwise the salt might seep through during baking, making your pork belly unpalatably salty. You just want to scratch the surface of the pork belly to encourage blistering during broiling. This step will take quite some time as you should try to poke as many holes as possible. Be patient and endure! - Fine salt / table salt cannot be used for the salt crust. Please get coarse salt! - We usually finish off the whole 500 grams of roasted pork between X and I in one meal, but if you are going to serve it with a lot of other side dishes, this amount may be enough to feed 4 people. But... you can just make more, because it's irresistible! Thks for your time and putting your master skill on to a video clip. Absolutely love it! Definitely will give a go! Hi Suzie! You flatter me, I think there are a lot of improvements that can be made to the video 🙂 Hope this helps in your attempt in making Siu Yuk and let me know how it goes for you! Thanks Charmaine! Hahah yea it was really fun to bite into the pork and make a loud cracking sound, let me know when you’ve made it! Your video is awesome! Wish that someone can help me to make a video of my bake and food… It is always me and only me that does the baking, cooking and photos. Must tell X that the both of you did a good job! Now more poke poke poke the pork? LOL! 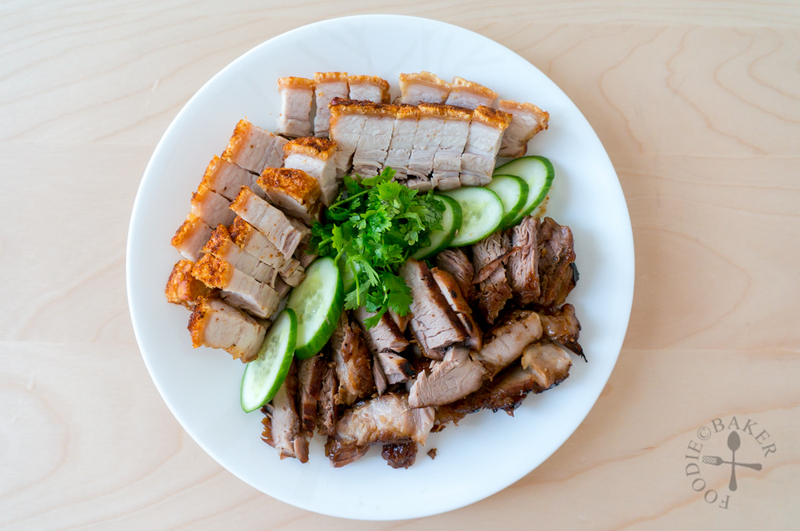 Glad your family loves a good crispy pork belly! Making this for Christmas sounds perfect, a delicious change from the usual turkey! The roasted pork looks amazing! I have yet to try making this myself even though hubby loves it, always seems like too much work! Shall try out your simplified recipe soon! Same here! I also always thought that making it is too troublesome, it’s so much easier to just buy it. I guess only when you have no access to it then you will have the urge to make them yourself haha. Jasline, I can’t make roast pork belly …. becos I’ll “chop off” the crunchy crispy skin and eat the lean meat. But seeing this so delicious looking 烧肉 of yours …. maybe I will try “fatless skinless roast pork” … ha ha ! Oh no! If only I’m your neighbour, I’ll go over and help you eat up all the crispy skin! Thanks Raymund. Yes I’m really surprised by how crispy it turned out! You are welcome Sharon! If photos can speak 1,000 words, videos will be able to speak infinity number of words (though I know I never say anything in the video haha) 😉 Have fun making the siu yuk! Great video, Jasline! I’d love to try this recipe too, it sounds delicious. Jasline, I love love love this recipe!!!! The video is amazing! love that crunch of the crispy crackling. Sharing every where my dear!